I began my Journalism work in 2004. In 2007, I began officially blogging and I have never felt the ethics and basic rules applicable to journalism should take a back seat when I blog. As a general rule, when I click the publish” button it stays published unless there is a clear grammatical or factual error. In that case, I have a duty to correct it. Over the years, I have many contact me and try to persuade me to change or delete my posts that do not fall in the above category. I think they all now know not to. I truly do not look at faces and could care less if we just broke bread yesterday. If I deem a story, whether provided to me me or in mainstream media, sufficiently interesting and relevant to both the journalistic and educational value I bring to my blogs, expect to see it published. 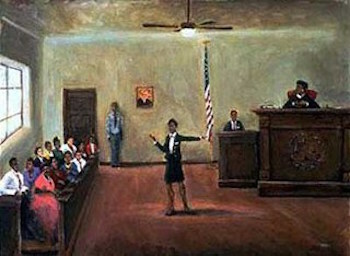 The above case involving a dispute against Actress Susan Peters illustrates the need for talents to understand that their actions are watched, written and evaluated in the public eye, constantly. Of late, our talents have acquired cars, mobile phones etc. 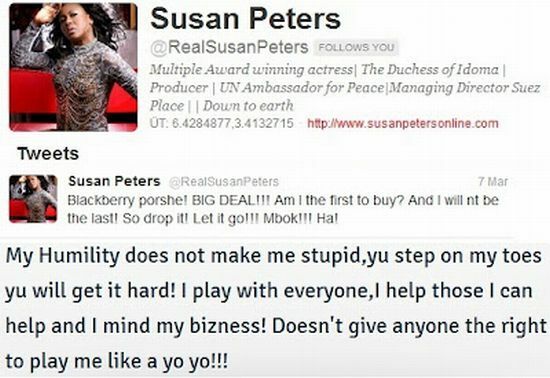 In this instance, Susan Peters acquired a blackberry phone. She posted the image on twitter. Linda Ikeji shared the story with her audience with minimal commentary and her audience went to bat attacking Susan Peters. 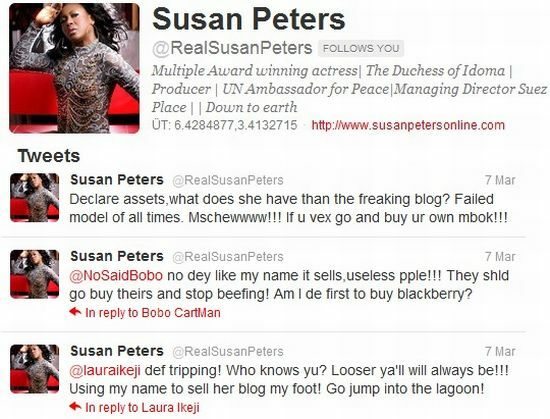 Susan Peters took to Twitter and proceeded to state the comments below. This then generated even more drama. “LIB/Susan Peters Faceoff: Apologies My Foot! 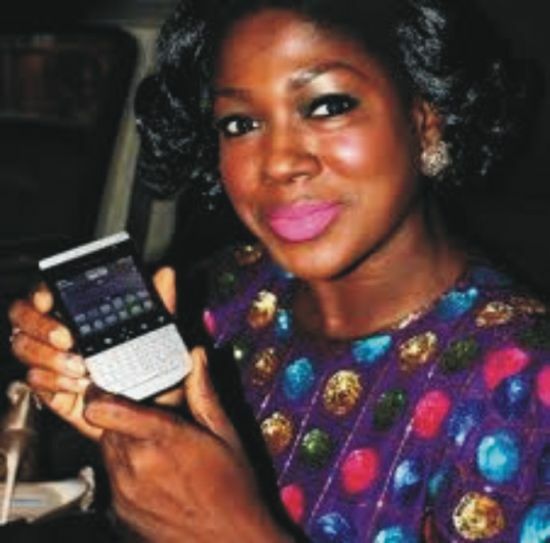 When last Tuesday, Linda Ikeji published on her entertainment blog, the picture of Nollywood actress Susan Peters posing with her latest acquisition – a Blackberry Porsche smart phone, nothing in the picture or the accompanying article suggests the slightest intent of malicious attack on the self-perceived superstar nor the cyber war the article would generate. As it has become synonymous with such posts on LIB, the Susan Peters article turned out not only to be a juicy piece considering the number of hits and comments it generated (some 216 comments as yesterday), but was equally devoured , appropriately digested and judgmentally spewed by readers and lovers of the blog. 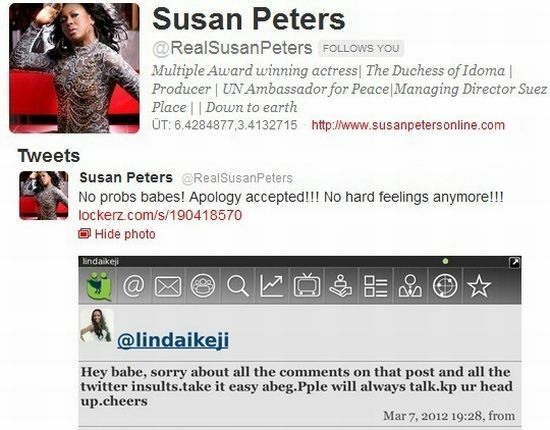 Quite unfortunately, Susan Peters retaliatory rants on Twitter over the comments of some of LIB readers and her targeted vituperation against Linda Ikeji, together with the controversial tendered apology of the latter to the former, has questioned the moral ethics of unbiased and factual reportage in journalism. 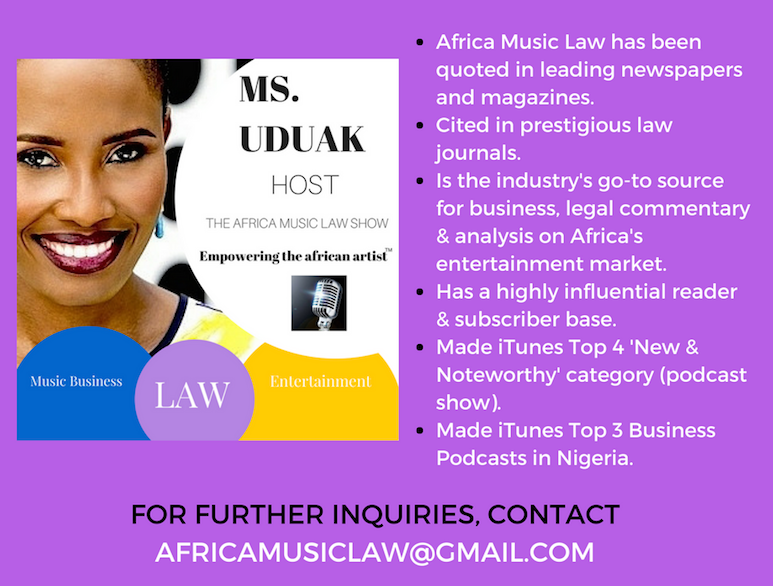 For starters, if Linda Ikeji was to be a true professional journalist in the real sense of it, she would have understood she owed Susan Peters absolutely no apologies for publishing both the article and the comments made by the readers. The tenets of the journalistic trade have it that such actions are solely reserved in cases where the writer has published erroneous or untrue stories. 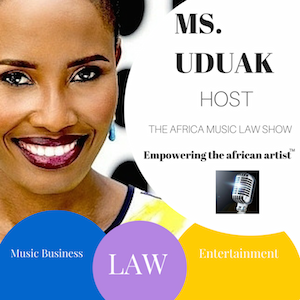 By quickly aligning herself with Susan Peters and tendering an apology, Linda Ikeji has proven firstly, that she’d rather curry the favour of some selected few to discharging her duties professionally and secondly, has indirectly stated that the opinions and actions of her fans meant little or nothing to her. (Dear Nigeria Bulletin, not true. I love my readers). For the records, the millions of readers of the blog made what LIB is today. Least Linda forgets, whatever she publishes on her blog can be readily sourced on other online and print entertainment platforms. Back to Peters, the uncouth mannerisms with which she attacked, Linda Ikeji, her sister and LIB readers who by extension can arguably be said to be her fans, further depicts the careless, arrogant and senseless attitude of some of Nigerian entertainers to their audience and fans. Calling her fans ‘nonentities’ and Linda ‘failed human being’ is the height of being irresponsible. These two set of people by extension are the media and fans that made her! Like the proverbial river that forgets its source, Susan Peters will fade fast into obscurity and irrelevance if not for these category of people. Common sense should have prevailed on her to first reason the consequences of having the paparazzi take the picture or make it public in the first instance. 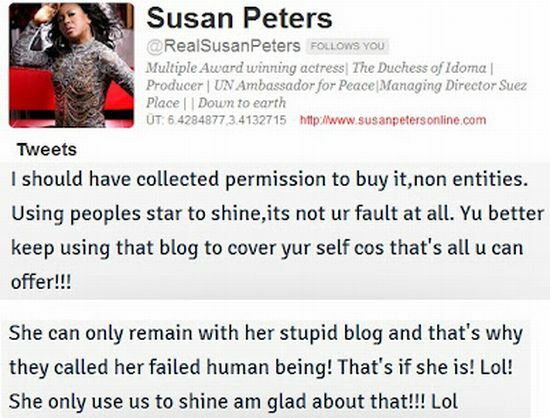 If Susan Peters understood the essence of PR, an intelligent thing she ought to have done is made her publicist (that is if she has one) handle the matter professionally rather that cursing and raving like the average omo alata over the social media.